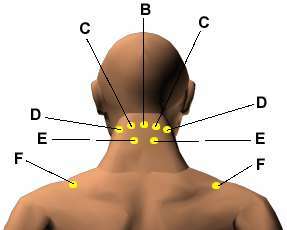 There are the acupressure points for relieving Neck Tension. Working on these points can help you get better quicker. You do not have to use all of these points. Using just one or two of them whenever you have a free hand can be effective. 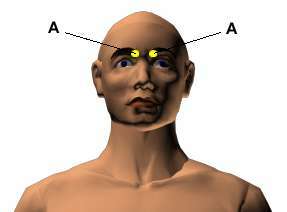 Location: In the indentations on either side of where the bridge of the nose meets the ridge of the eyebrows. Benefits: Relieves neck pain, headaches, hay fever, eye fatigue, and sinus pain. Location: In the center of the back of the head in a large hollow under the base of the skull. Benefits: Relieves stiff neck, shoulder and neckn pain; pain in the eyes, ears, nose, and throat, as well as mental problems, headaches, and vertigo. Location: Below the base of the skull, in the hollow between the two vertical neck muscles. Benefits: Relieves arthritis, headaches (including migraines), dizziness, stiff neck, neck pain, neuromotor coordination problems, eyestrain, and irritability . Location: In the indentation at the base of the Skull, one to two inches in back of the earlobe, depending on the side of the head. Benefits: Relieves stiff necks, neck and shoulder pain , and headaches. Caution: Pregnant women should press lightly on this point. Location: On the muscle at the highest point of the shoulder, one to two inches out from the side of the lower neck. Benefits: Relieves shoulder tension, nervousness, irritability, and fatigue.